Powerful, sophisticated acquisition and analysis algorithms. Measure the skin conductance level (SCL) and skin conductance response (SCR) as they vary with sweat gland (eccrine) activity due to stress, arousal or emotional excitement. Record wirelessly with BioNomadix® for both in lab applications and with the BioNomadix Logger to record data from participants at home, work and play, or use wired EDA100C amplifiers in the lab or EDA100C-MRI in the MRI. 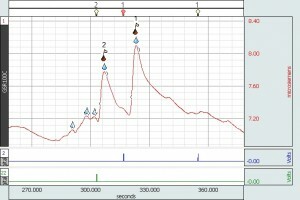 AcqKnowledge® software includes a fully-automated electrodermal response scoring tool that locates skin conductance responses, visually identifies them on the waveform and extracts key measures. 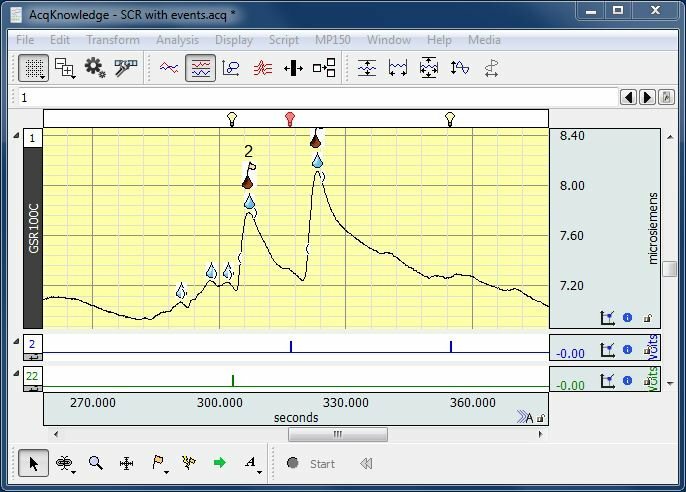 Automatic event related EDA analysis can also be performed by locating the onset of the discrete stimuli and identifying specific and nonspecific SCR within a user specified time range. AcqKnowledge software can interface with multiple stimulus presentation programs including Superlab®, E-Prime®, DirectRT®, MediaLab®, Inquisit®, and Presentation®, plus Vizard® for virtual reality (VR). Use the new Focus Areas analysis tool for targeted EDA Analysis. Focus Areas allow the user to specify and mark areas of interest in the data and run automated analysis routines or the cycle detector specifically on the Focus Areas instead of the entire data file. 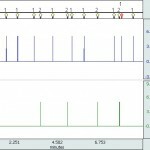 For basic EDA processing, take advantage of numerous filters, tools, and Automated Analysis routines in AcqKnowledge. 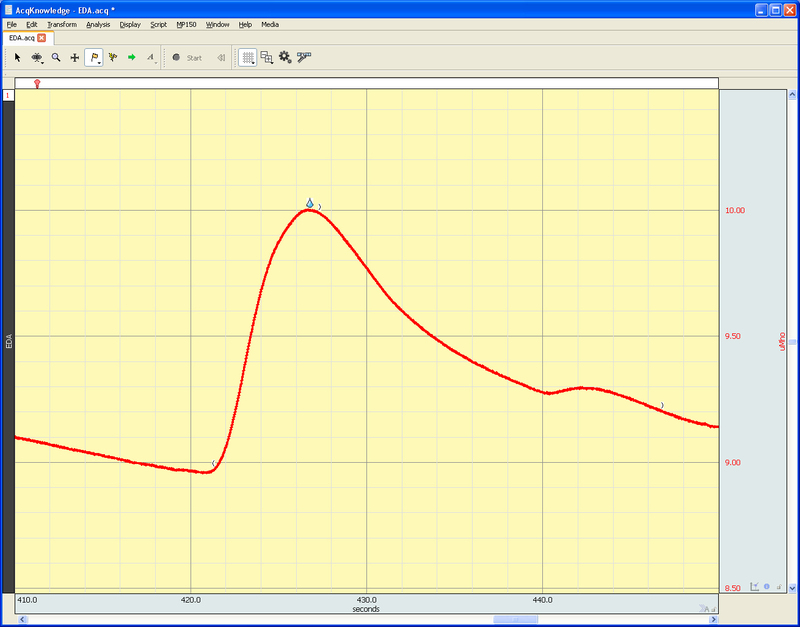 This transformation uses baseline smoothing or high pass filtering to construct a new Phasic EDA channel in the graph. This routine is automatically included in both the locate SCR and Event-related EDA routines. For studies requiring the examination of spontaneously occurring skin conductance responses, such as social paradigms, cognitive tasks, and arousal studies, use the Locate SCR routine in AcqKnowledge to locate and score spontaneously occurring responses. Run the Event Related EDA Analysis and the software will provide a frequency analysis over a user defined time period, between events in the data, or over a user selected region of data. 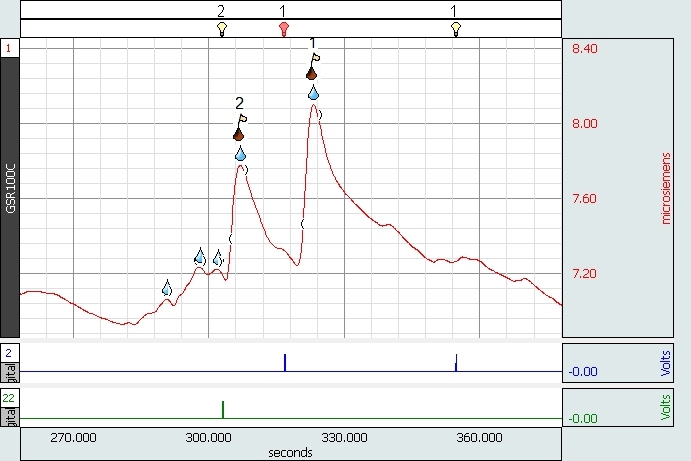 Locate SCRs analysis will identify skin conductance responses and visually score the waveform. All SCR events are marked on the tonic waveform. 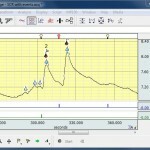 In the SCR location mode the software marks the event onset, SCR point of max response, and waveform end. Responses can also be manually adjusted using the event marking tools. For determination and correlation of EDA responses tied to a particular controlled discrete stimulus (visual cue, tone, image, mechanical stimulation, light flash, etc.) AcqKnowledge offers a fully-automated event-related EDA analysis routine. The routine scores and reports the data in two steps. First, discrete stimuli marked by TTL pulses or via manual insertion are converted into AcqKnowledge events by the digital input to stim events feature. The Digital input to stim events function works with TTL trigger information coming from applications such as Superlab®, E-Prime®, DirectRT®, MediaLab®, Inquisit®, Vizard®, and Presentation® and converts TTL data acquired on the digital channels of an MP device into useable stimulus events. 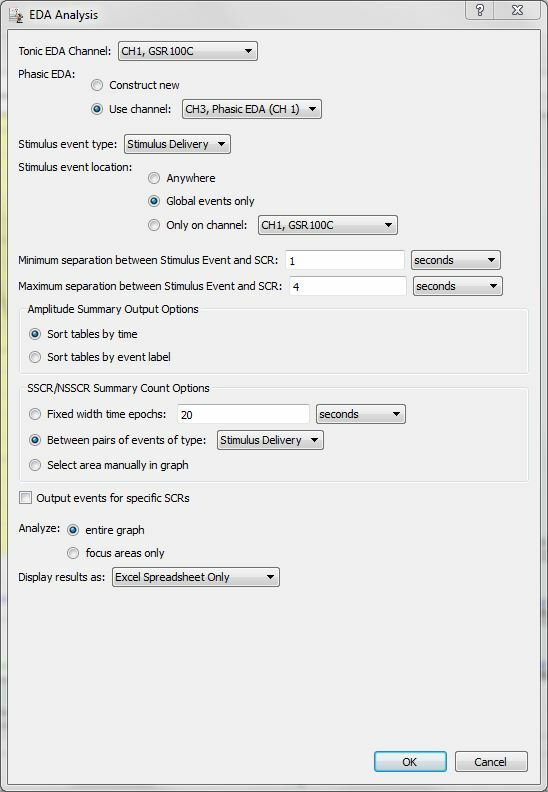 Next, stimulus events are marked as they occur in the data and AcqKnowledge automatically measures, or averages the response to the stimulus. 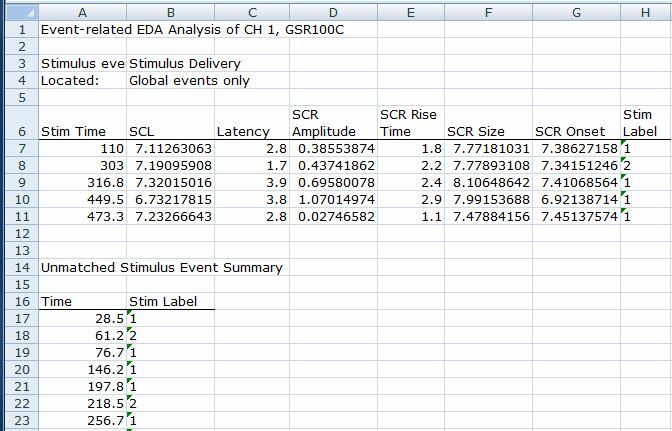 To determine whether stimulus responses are specific (SSCR) or nonspecific (NSSCR), users can specify a time window around the stimulus event for measuring the data. 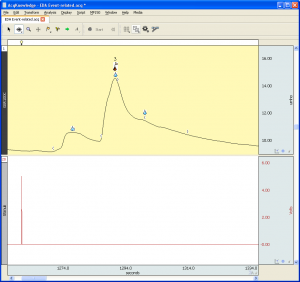 Results can be pasted to a Journal file or automatically exported to a spreadsheet. The results of the analysis are broken down into four parts and follow the guidelines set forth in the Handbook of Psychophysiology. Unmatched Stimulus Event Summary: Includes all discrete stimulus events that were not matched with a valid SCR response. The table displays event time and stimulus type. 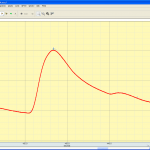 SCR Frequency Analysis: Includes each stimulus type, the frequency of specific and nonspecific responses along with the predefined epoch width. Stimulus Matching Summary: Includes the amplitude, magnitude, total number of matched, total number of non-matched, and frequency percentages for each stimulus type.